Heat a saucepan, add water, salt and let it boil for few minutes . Wash and soak rice for few minutes. Add basmati rice to the saucepan and let it cook for few minutes. Drain off the water and keep it aside. Now, heat butter in a pan, add asafoetida, cumin seeds, onion and saute it well. Then add chopped vegetables and salt. Close the lid and let the vegetables cook for 3 – 4 minutes . Add garam masala, chilli powder, turmeric powder and dry mango powder. Mix it well, add cooked basmati rice and coriander leaves. Toss the rice with the masala mixture and close the lid Your tawa pulao is ready to serve. 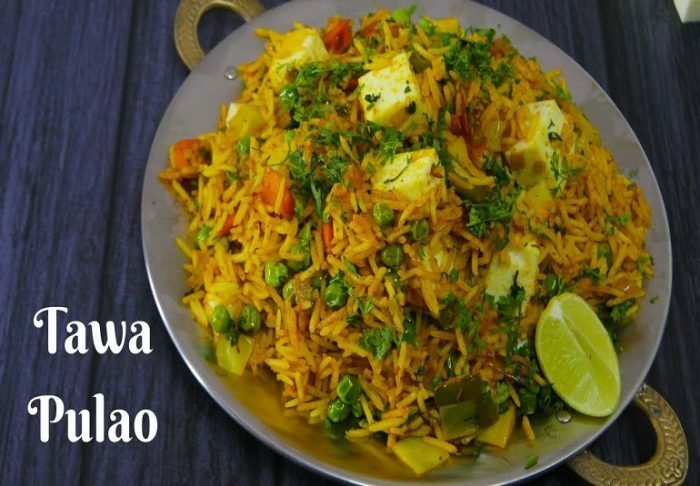 Top the pulao with paneer and cheese cubes. Looking for Great Indian Food Recipe which can fulfil your food curving. Here is one of the Wow-some Recipe which can definitely make your taste buds its Quick and Easy Pulav Recipe. It’s a Street Style Veg Pulao recipe easy to make at home with minimal stuff just like verities of veggies and spices to make it more delicious. For making this vegan recipe you can use leftover rice to add some additional taste to your daily food. 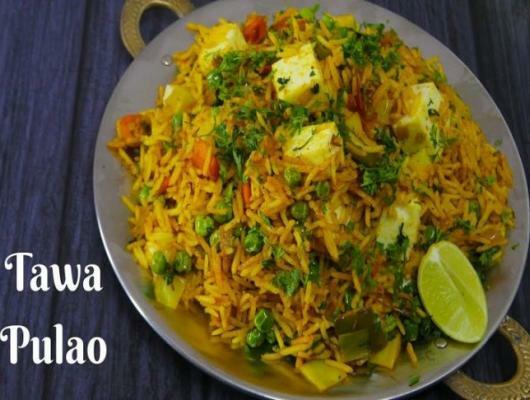 This is instant Veg Pulao recipe for those who have a strong craving for Veg Pulao Recipe but does not have all the time to prepare. It’s very easy and simple to make in just 30 minutes.